By the middle of the 18th century New York City saw the development of its own aristocratic class. Country estates north of the city were built by wealthy merchants and military officers and elegant town houses provided style and luxury to their owners on a par with London. Captain Archibald Kennedy of the British Navy built his residence at No. 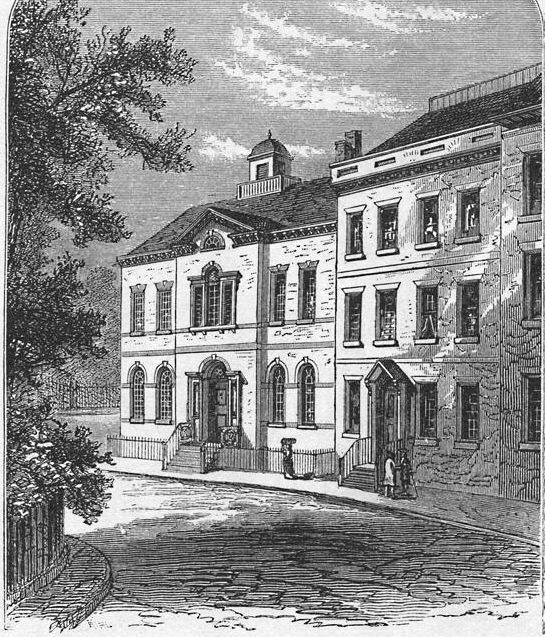 1 Broadway in 1745 on the site of the famous tavern of Mrs. Kocks, built by her husband who was an officer in the Dutch Navy. By now Broadway was the most fashionable street in the city, and the site at the corner of Reade Street was extremely desirable. Long before landfill would widen Lower Manhattan, the river flowed nearby, providing refreshing breezes and idyllic views. Over a century later, in 1896, The New York Times noted "It was virtually an imported building, all the materials, including bricks, tiles, carved mantels, doors, windows, and other things entering into its construction having been brought from Holland." The two-story mansion was perfectly symmetrical, its floors being delineated by two stone string courses. A Palladian window in the slightly protruding central section was mirrored by the entrance below. Here the Kennedy’s first son was born, who would eventually become the 12th Earl of Cassilis and Marquis of Ailsa. 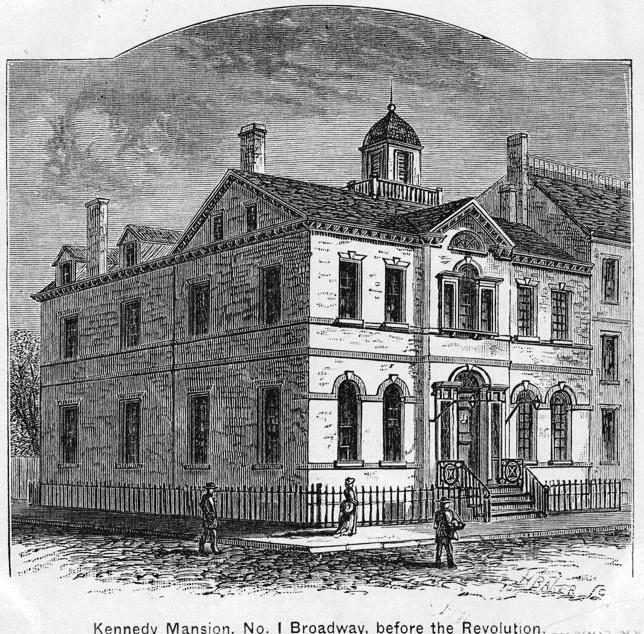 As the clouds of revolution formed over Manhattan, Kennedy sent his family to New Jersey and later abandoned his fine home as well. In 1775 General George Washington sent General Charles Lee, with an army of 1200 Connecticut volunteers, to march on New York. Upon arriving, Lee encamped his troops in what would become City Hall Park and made his headquarters in the Kennedy mansion. Lee’s choice of the house was, apparently, infectious. Every succeeding commander throughout the war took over No. 1 Broadway. Putnam, Washington, Sir Henry Clinton, Robertson, Carleton and other British officers established themselves here. It was from here that Andre wrote his letter to Benedict Arnold, who was occupying No. 3 Broadway, the home of Robert Livingston. Following the Declaration of Independence, Colonel Patterson, Lord Howe’s Adjutant-General, called upon George Washington at No. 1 Broadway in an effort to reach “an understanding” between the Crown and the colonies. Washington received the Colonel in full military attire. Patterson produced a letter from Howe addressed to “George Washington, Esquire, etc., etc., etc.” The Colonel remarked that the three et ceteras “might mean everything.” Washington agreed; however he added that in his official capacity he could receive “only letters officially addressed.” The letter was neither delivered nor read. Patterson requested Washington to relinquish his commands for Lord and General Howe. With the courtesy expected of a gentleman, Washington replied, “My particular compliments to both of them.” Later General Howe would remark that the meeting was “more polite than interesting;” however it had induced him to rethink how he addressed his letters. From that moment on he addressed Washington by his proper title. Although Sir Henry Clinton used the house next, Washington returned here after the British evacuation. It was from the Kennedy house that Washington left to make his farewell address to his officers at Fraunces Tavern. After the war the house became home to banker Nathaniel Prime; although it would remain in the ownership of the De Peyster family, relatives of Ann Watts, until the 1850s. Although the War of 1812 and a subsequent financial depression slowed development in Manhattan, the city continued to grow. As development pushed northward, the once elegant residential neighborhood of Lower Broadway became commercial. Captain Kennedy’s beautiful mansion was converted to the Washington Hotel. Two floors were added in remarkable sympathetic deference to the original architecture. A handsome balustrade lined the roof and splayed lintels mirrored the originals of the second floor. 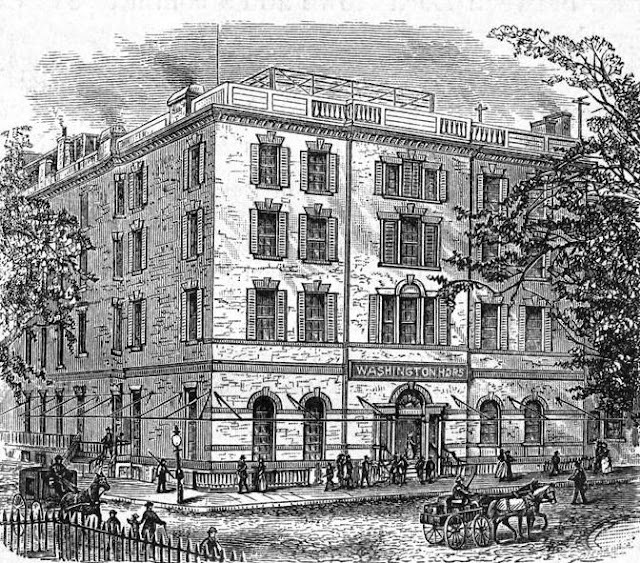 The hotel quickly became a popular site for entertainments. On January 21, 1842, for instance, a ball was held to pay tribute to the teacher J. L. Garrets. 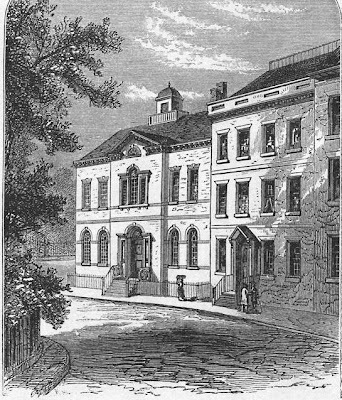 A. Butman, chairman of the event, invited “the friends and pupils of Mr. J. L. Garrets being desirous of testifying their regard for his attentive and gentlemanly behavior towards them,” through a notice in the New York Tribune. The hotel was especially popular with the growing temperance movement. 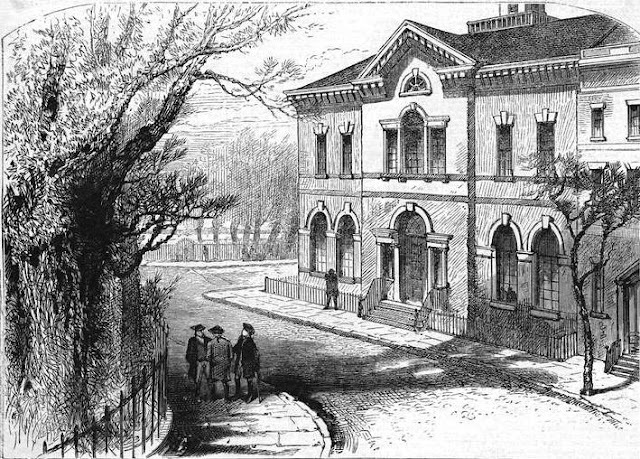 The same year notice was given that Mr. Covert’s Temperance Concert would take place on Friday evening, October 28 “which could not be given on Monday evening, the Church being without notice closed against him.” A year later, on May 11, The Franklin Temperance Society held its “Great Washington Meeting” here, during which “several distinguished strangers” addressed the meeting. 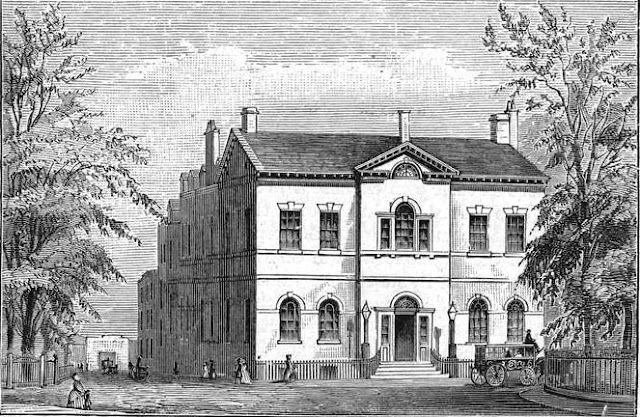 On January 17, 1844 the Lady Franklin Temperance Society gave a Grand Festival in the hotel. Other than the hotel’s name—a nod to Washington’s occupancy—the historic importance of the building was overlooked. Perhaps because their history was so young, 19th century Americans most often placed no importance on historic structures or places. Mrs. Lamb noticed, however. In her book she complained “There was no plate let into the wall, no marble slab, no sign whatever, such as marks in older countries the houses of famous men and of interesting associations…The elevators, the telephones, the bath-rooms, the cuisine, the cleanly comfort and luxury, of our great hotels, compensate the traveler for the absence of such associations. But they can not supply the romance." By 1881 the land on which the old building stood was far more valuable than the hotel. On December 16 The New York Times reported on the sales of the furniture and fixtures at public auction. Despite The New York Tribune noting that “More memories associated with events which are fastened immutably in history are attached to this ancient spot than to any other on Manhattan Island,” the fascinating Washington Hotel was razed. In its place rose the 10-story Washington Building. The New York Times explained the demolition with crystal clarity. "But commerce is a vandal, as well as a civilizer, recognizing no sentiment in its trade marches; so the old house had to go to make way for the structure which in its turn will, perchance, have to give place to one of yet larger and more modern build before many years." What a pity that we do not value our heritage, our history, and our buildings more than we do. I am currently reading "1776" by David McCullough and had to take a look at "No. 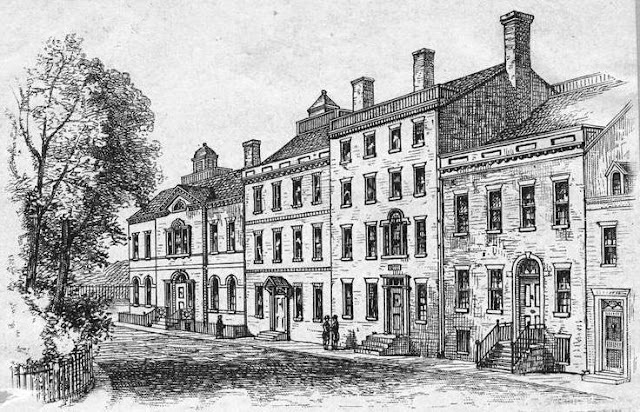 1 Broadway", the home that General George Washington had visited/worked, in preparation for battle with the Redcoats. What a tragedy that the home and the history is relegated now to books and can't be touched or seen today. I am also reading 1776 and it is really a shame that the old house could not be preserved. I TOO am reading 1776 and was so happy when I googled 1 broadway that it brought me to this amazing blog that I follow already!! I'm a couple years behind but I am also reading 1776. Fun to see people think of this the same way as I. Unfortunate but understandable considering the growth of NY. Even looking at Boston and how that city has changed from the heights of Dorchester. I'm so glad I found this post. What brought me here was binge watching Turn on Netflix.. A scene in season 4 episode 5 takes place at Kennedy House. Turn is a great series about the spy ring that Washington used to great advantage. I'm also here because of the series Turn! I am so sorry to see that the house is no more. I'm from Fredericksburg, VA where George Washington's boyhood home, Ferry Farm, is located. I love history and visit old houses. The Kenmore Plantation is also in Fredericksburg and was the home of Washington's sister and her husband. It was thankfully preserved. Reading McCullough's 1776 as well. That history is preserved in print serves us well. Those interested will look for those landmarks mentioned. Unfortunately, historical preservation has a cost. There's also the selection process for what is historically significant. Don't forget the Confederate Purge of 2017. We have a print from my great aunts estate that shows number one Broadway in 1776 showing my ancestor British officer Kennedy leaving his mansion to be escorted by the Royal dragoons.